Using our advanced virtual staging software technology we are now able to offer our virtual tour providers an amazing Virtual Home Staging product at an unbelievable low price! Take a photo of an empty room and then virtually stage it with modern or antique furniture & decorations. Our virtual staging software allows you to add in couches, tables, rugs, lamps, tv’s, draperies, pictures and many other furniture items to make the home look fully furnished and more appealing. Now Do-it-Yourself or Full Service Available! Choose 1 or 2 Below. (Chrome and Safari Browsers supported). Need Help? 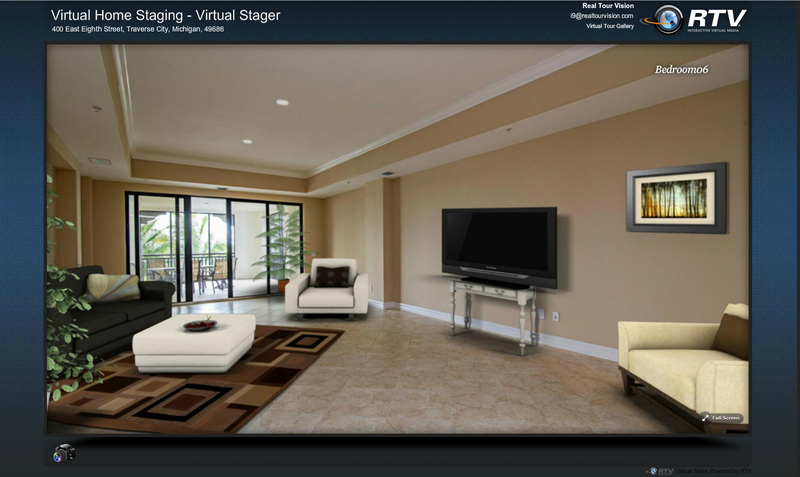 Be sure to watch our Virtual Staging Software training video. After you sign up we will add you to our virtual staging news list. With more and more homes now being vacant due to foreclosures, virtual staging is in demand than ever before. Virtual Staging is frequently employed by homeowners and real estate agents to help show properties to their best advantage. A virtually staged home shows better than an empty home. As wonderful as traditional home staging is, there are some drawbacks as well. Actual staging can give prospective buyers the impression that window treatments or other furnishings are included with the purchase of a home. Home staging is also quite expensive. The cost to rent furniture and other furnishings in a down market with extended sale times can add up. This is where virtual home staging becomes quite appealing. Virtual home staging is the process of taking digital photos of empty rooms, inserting digital furniture, window treatments, and other decorations. The attributes of each property are enhanced by the staging, rather than showcasing the taste of the homeowner. Virtual home staging costs a fraction of a physical home staging and is a great tool to help showcase the home to prospective buyers. Maybe you have heard of virtual staging on the real estate photography boards and thought it was something you should add to your virtual tour business. Perhaps you have not started offering this yet because you do not have time in your busy schedule to learn a new piece of software. Whatever the reason, the time to get started with Virtual Staging is now, and we are pleased to offer this one-hour virtual staging training webinar just for you. Watch this recording, and you will learn how to virtually stage on your own in under one hour. Get ready to become a virtual staging expert with the help of the team over at Real Tour Vision. There is no cost for you to set up your virtual staging account so be sure to set that up before watching this show. Before watching the video below make sure you have already set up a virtual staging software account above!